I have been a big fan of the Lupo Superpanel series. 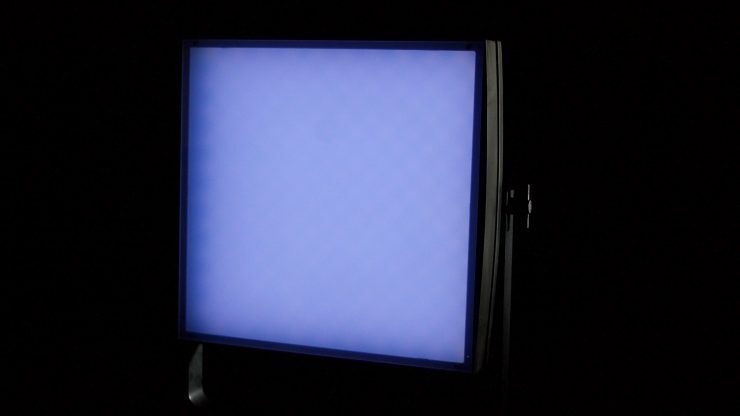 They are high output, color accurate, and well made 1×1 panel lights that are hard to beat at their price point. Lupo’s newest addition to the Superpanel’s family is the Full Color 30. 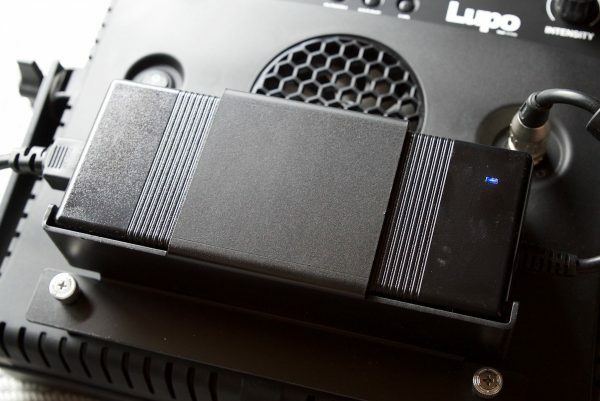 This is Lupo’s first foray into RGB lighting and follows a growing trend of lighting manufacturers using this technology. 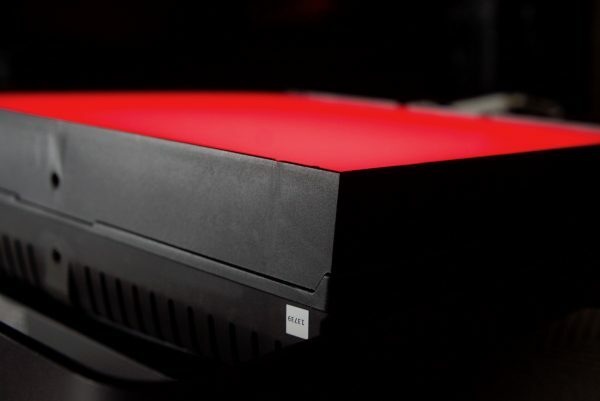 To date, most of the RGB lights that have been released are large, heavy and expensive. 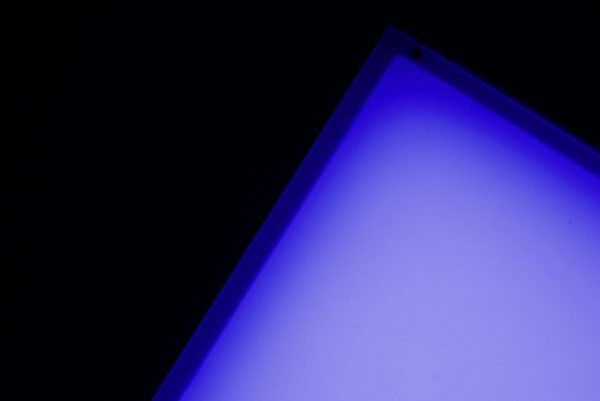 Surprisingly there are almost no 1×1 RGB panel lights available, apart from the ARRI SkyPanel S30-C, Luxli Timpani 1×1 RGBAW LED light and the yet to ship Dracast 728 Led RGB White Panel. 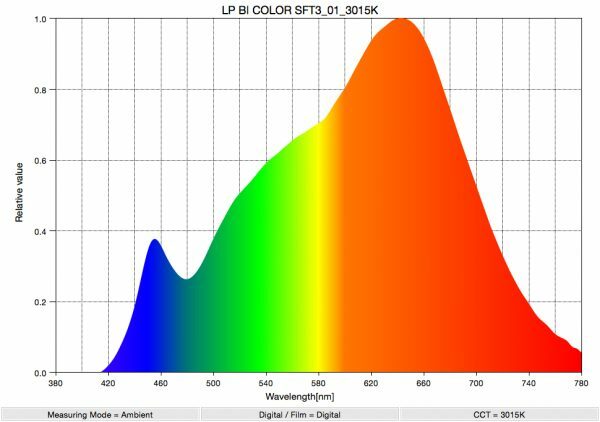 This looks like it is changing and I’m sure over the next few months we will see more 1×1 RGB solutions hitting the market. So what can the Superpanel Full Color 30 do? The light can be set to any Kelvin color temperature from 2800K to 10000K. There is also the ability to have full control over adjusting green and magenta. In the RGBW mode, you can control red, green, blue and white independently to produce a range of different colors. HSI mode allows you to have full control over hue, saturation, and intensity of any color. The Superpanel Full Color 30 has a collection of preset filters and special effects that you can quickly use on the set to create interesting lighting effects. You can change parameters for all of these effects such as frequency, intensity and effect speed. All the effects work as advertised, and while it’s not something I’m likely to use often, it’s good to know you have them at your disposal. In the Preset Mode, there is 19 presets you can use, 14 factory presets and 5 user presets. To store your presets, you can be in either CCT/HSI or RGBW modes. Once you have created the light you want to store as a preset, you simply press the Up and Down buttons at the same time. You then use those same buttons to find where you want to save the preset and press the Mode button to save. The only problem with the User Presets are you can’t rename them, so if you store something you would have to write down what it is to remember what is stored there. The nice aspect about the Full Color 30 is it already has a built-in front diffusion panel. This really helps the fixture create a very nice soft and flattering lighting source. With traditional 1×1 panels that don’t have a built-in diffusion panel you really need to use a softbox or use them with some sort of diffusion material to generate soft light. 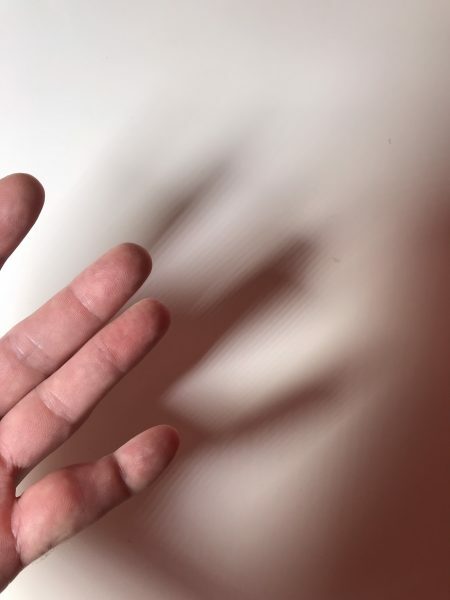 The other benefit of having an inbuilt diffusion panel is you don’t get those nasty cross tach shadows that you see from LED lights that don’t use a strong diffusion panel. Above you can what the shadows are like from the Luxli Timpani 1×1 RGBAW, a light that doesn’t have a strong diffusion panel like the Lupo. The Full Color 30 has physical dimensions of 335mm x 320mm x 100 mm (13.18″ x 12.59′ x 3.93″) and weighs in at 3.7kg (8.15lb). With the power supply attached it tops the scales at 4.3kg (9.47lb). This is certainly quite a bit heavier than the Superpanel Dual-Color Soft which weighs in at 2.8 kg (6 lb). The Full Color 30 is also slightly thicker (100mm) when compared to the Superpanel Soft Dual Color (90mm). If you compare it to its direct competition the Luxli Timpani 1×1 RGBAW, that light has dimensions of 310mm x 310mm x 35mm (12.25″ x 12.25″ x 1.4″), and weighs in at 3.15kg (6.95lb). The Superpanel Soft Dual Color drew 150W which allowed it to be run off a high capacity camera battery, but the new Superpanel Full Color 30 draws 200W (DC supply from 14.8 V to 24 V) which makes it more difficult to run remotely off camera batteries. 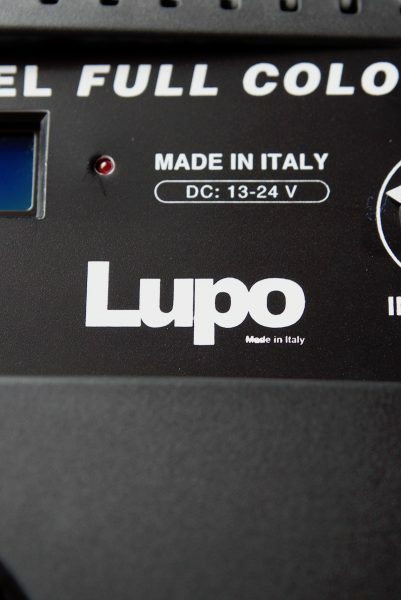 Lupo recommends that you use a 230 Wh battery. Unfortunately, if you travel a lot on planes you can’t take batteries over 160Wh. This doesn’t make this light a very travel-friendly solution, especially if you need to run lights remotely without mains power. One solution would be to use two 150Wh Hawk-woods Mini V-Lok batteries on a dual battery plate. In comparison, the Luxli Timpani 1×1 RGBAW light draws just 120W and is a lot easier to run off common camera batteries. 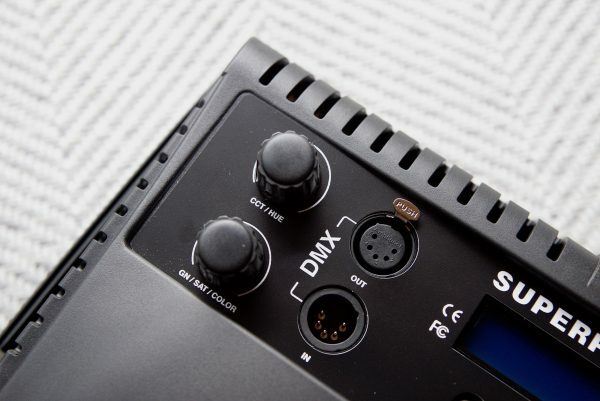 The Full Color 30 has a simple digital display on the back of the light that lets you see and change the settings for intensity, color temperature, color mode, green/magenta adjustments, dimmer curves, special effects and DMX channels. 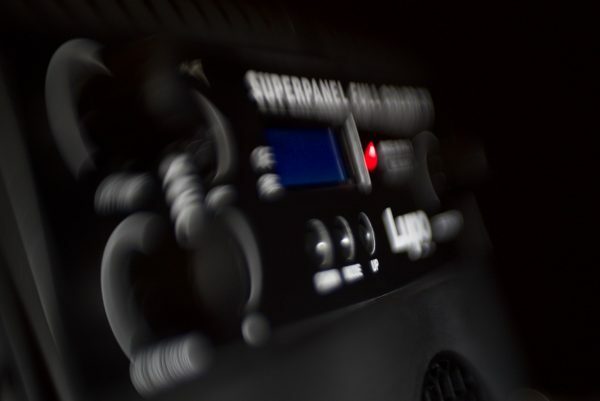 Just like other Lupo Superpanels, the controls for the Full Color 30 are simplistic, but with the newly added features, It does make controlling the light a little more complicated. I don’t necessarily think this minimalistic approach to the control layout works as well as it could on the Full Color 30. You really do need to read the instruction manual to figure out how to make changes. While controlling the intensity and Kelvin color temperature still remains simple to do, once you need to enter other operation modes and make changes it becomes a bit of a memory game. Due to the limited controls on the fixture, you find yourself having to press combinations of buttons to make any changes. I would have preferred to have seen dedicated buttons added for HSI, RGBW, and the Special Effects Modes. This would make it far quicker and easier to use the light. I would have also liked to have seen some sort of wi-fi or Bluetooth app and control made available for the light. This would have made controlling the RGBW and HSI modes a whole lot easier. In saying all of this, like any new product you get, it always takes time to become familiar with its operation and use. 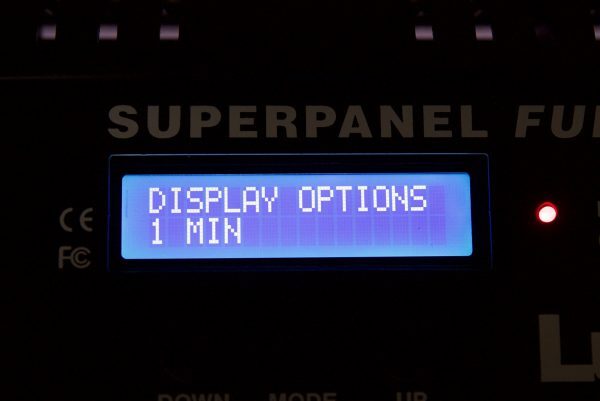 The Superpanel has a recessed on/off switch, a color temperature adjustment dial, a DMX In and Out, a dimmer dial and simple LCD display screen with three buttons. The light has a bracket you can attach that holds the AC power supply firmly in place, and this can be swapped out for a V-Lock battery plate if you need to power it remotely. The light is fully dimmable from 1-100% in one per cent increments, and you can also adjust the kelvin range in one-kelvin increments for precise color temperature. Unlike most other Superpanel lights (except the Superpanel Dual-Color Soft), the Full Color 30 has a very wide 115-degree beam angle. This makes the light great for lighting up larger spaces or for throwing color onto a background. If you do want to use it for interviews you will need to use the optional barn doors or an egg crate. One of the egg crate options available is a 40-degree snap grid from DoPChoice. What I liked about the LED display is that you can set it to turn off after a select amount of time so you don’t emit any unnecessary light, this is handy if you are working in dark environments. 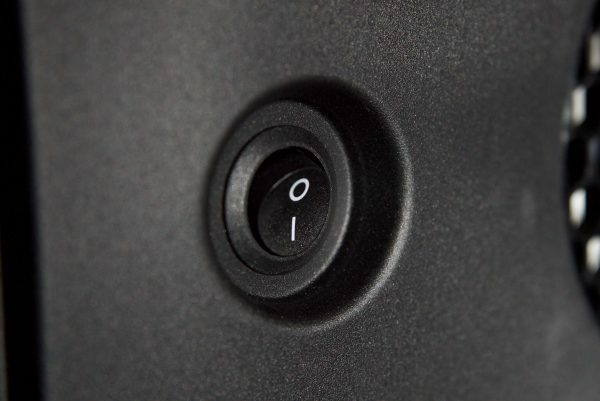 By touching any of the dials or buttons the display’s brightness comes back on. The light has a 1/4 20″ threaded hole on the top and the bottom of the light for attaching the optional barn doors. For an Italian made product, there is no Versace or Ferrari style flash to the Full Color 30. The fixture is all business and is nothing special to look at. Instead, Lupo has just concentrated on making it robust and easy to use. The yolk frame is solidly constructed and the locks on the yolk tighten down very securely. 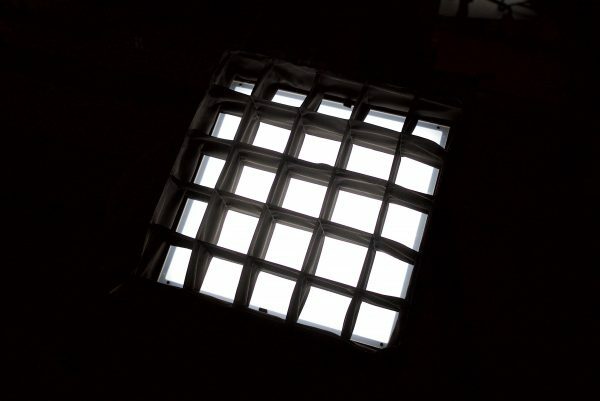 The casing of the fixture is made out of reinforced technopolymer and feels fairly robust. It is matte black in color which is good because it doesn’t reflect any light. The only problem I found with the finish on the casing of the light is it is very prone to scratches. While this is more of a cosmetic issue, than a build quality issue, some potential buyers may not like this. It will be interesting to see how reliable the Full Color 30 will be over time. From using other Superpanel lights over the last few years I have found them to be very reliable and robust. Whether the Full Color 30 with all the new features follows in those same footsteps only time will tell. A lot of manufacturers (and I’m not sure if this applies to Lupo or not) are really pushing their LED lights to the limits and the lifespan of those fixtures can certainly be compromised. I have had several LED panel lights (not Lupo’s) that ran really hot and ended up dying after only a year or so of use. 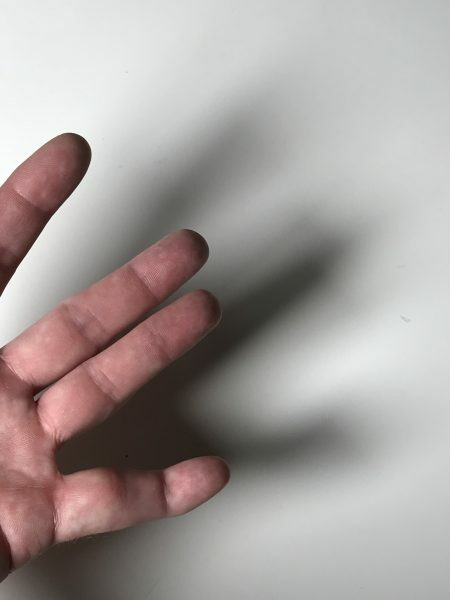 If the LED light you are using is really hot to touch then there is a good chance it isn’t being cooled correctly and it could end up dying long before it should. 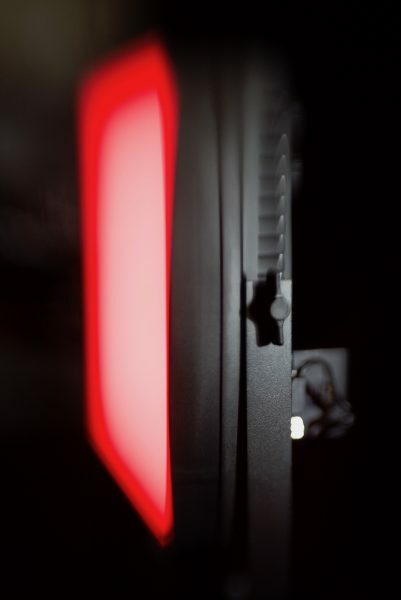 Like other Superpanel lights, the Full Color 30 has an inbuilt fan to keep it cool. RGBW LED’s run a lot hotter than conventional LEDs and therefore they need to be used in conjunction with fans or heat sinks to keep them cool. 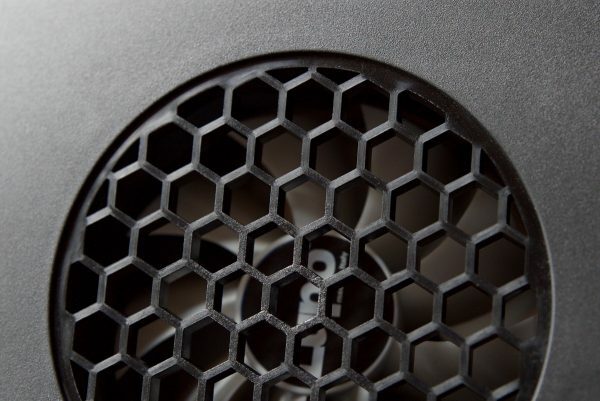 The fan on the Full Color 30 is barely audible, but the back of the fixture does get hotter than that of the Dual-Color Soft. Just like other Superpanel fixtures, you can turn the fan off, but if you do the maximum intensity level is limited to 50%. I tried out the 40-degree egg crate made by DoPChoice and found it very easy to use and attach to the Full Color 30. What you do have to keep in mind is if you want to run the Full Color 30 off a camera battery you have to spend an additional $97 USD for the Lupo V-Mount Battery Plate for Superpanel. While there are lots of 1×1 panel lights on the market, there aren’t many affordable 1×1 RGBW options. In fact, the only ones that I know of are the Luxli Timpani 1×1 RGBAW LED light and the yet to start shipping Dracast 728 Led RGB White Panel. You could argue that the ARRI SkyPanel S30-C is also a competitor, but at $4,113 USD it’s not even close to these other options when it comes to price. Most RGBW lights on the market are large, heavy and expensive. I’m actually surprised that Litepanels hasn’t made a 1×1 sized RGBW version of the popular Astra. With the direct competition being the Luxli Timpani 1×1 RGBAW LED light and the Dracast 728 Led RGB White Panel. Let’s see how they compare to the Lupo Superpanel Full Color 30. As I haven’t seen the Dracast I can only compare the Luxli. If you are interested to see how the Luxli compares head-to-head against the Lupo when it comes to performance, those results are further down in the article. So now let’s get to the photometric results. I always test lights in this way so that I get a reference to how they compare to other fixtures. Results only tell part of the story and should never be used alone to judge a light. I have found from extensive testing over the years that certain lights that have good photometric results don’t always look good, and lights that have worse photometric scores can sometimes look better than their results indicate. 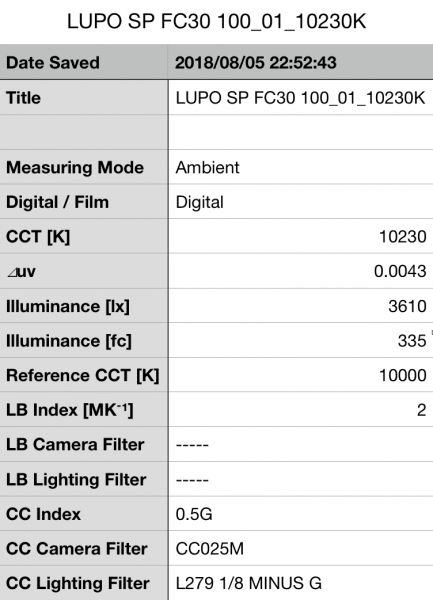 I tested the Lupo Superpanel Full Color 30 at a variety of Kelvin color temperatures with a Sekonic C-700 Spectrometer to find out how much output the light had and how accurate the Kelvin color temperature reproduction was. All readings are taken at a distance of 1m (3.28ft) in a controlled environment. Above you can see the light recorded an output of 4380lx (407fc) when set at 5600K and run off mains power. 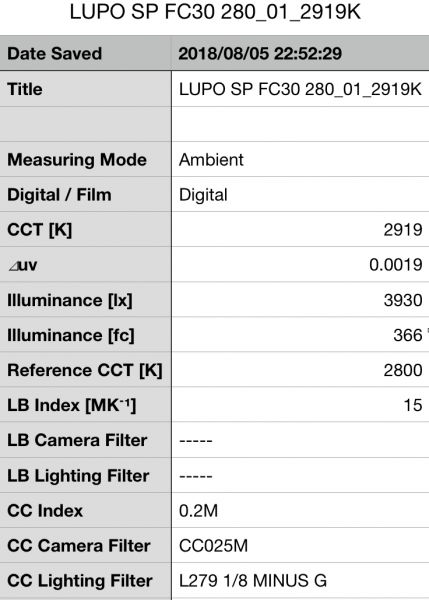 The LUPO produced a Kelvin color temperature of 5423K. The Superpanel had a 0.3M CC Index score. This output was impressive for any Soft Panel 1×1 fixture, let alone an RGBW one. The 5423K reading was a little lower than what I would have liked to have seen when using this light at 5600K. In terms of output compared to the LUPO Superpanel Dual-Color Soft, it was 12.88% brighter. So how does that compare to its direct competition, the Luxli Timpani 1×1 RGBAW LED light? Above you can see the results from the Timpani. The Luxli has 1000lx less output (25.77%) than the Lupo. 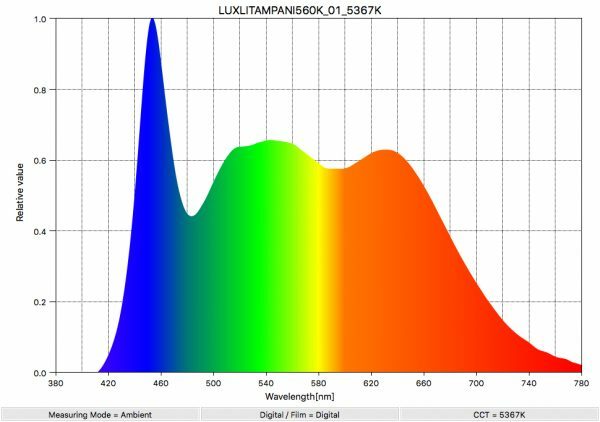 The Kelvin color temperature of the Luxli at 5600K was 5367K, which was lower than the 5423K recorded by the Lupo. The Luxli, however, did have a perfect CC Index score of 0. 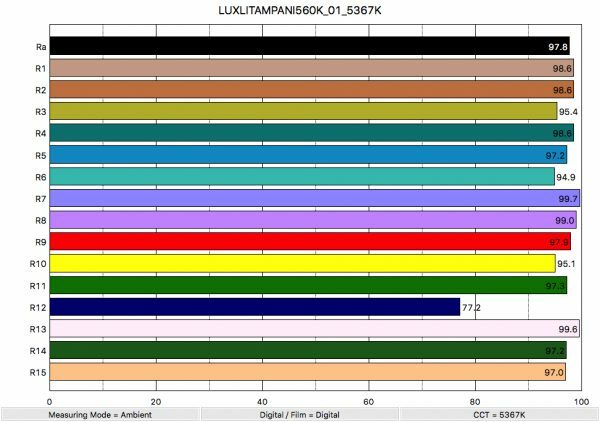 Here is how the 4380lx output and 5423K Kelvin color temperature I measured from the LUPO compares to some other Bi-Colour Soft Panel 1×1 fixtures including Lupo’s own Superpanel Dual-Color Soft. I did these comparisons because I was interested to see if the use of RGBW technology in the Full Color 30 came at the sacrifice of output or Kelvin color accuracy. As you can see both the Litepanels and the F&V have quite a lot less output than the LUPO Superpanel Dual Color 30 at 5600K. 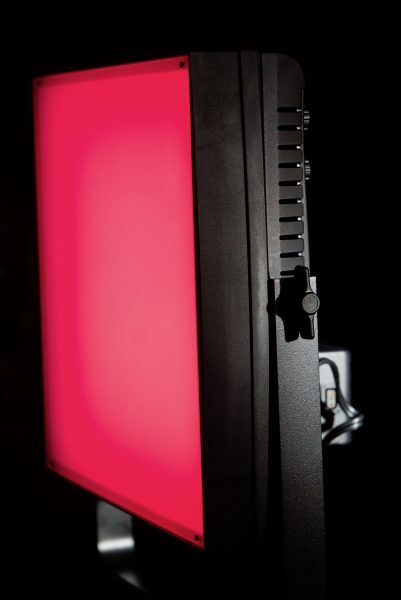 The Dual Color 30’s output was 46% higher than the Litepanels and 94.66% higher than the F&V. 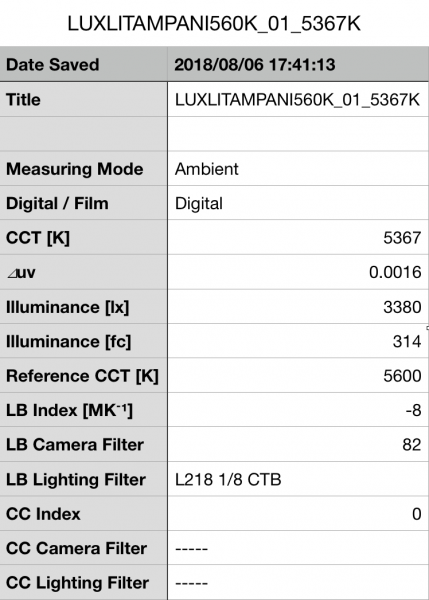 The Litepanels was more Kelvin color accurate when set at 5600K and it also registered a 0.1G CC Index score. Now as the LUPO Superpanel Full Color 30 has a CCT mode you have the ability to have full control over adjusting green and magenta. With this in mind, I decided to see if I could get the LUPO’s CC Index reading to 0 when using it at 5600K. I found that by adding +0.20 Green I was able to achieve this. Above you can see the results after the change. The CC Index went from 0.3M to a perfect 0 after I made the adjustment. The Kelvin color temperature also improved slightly to 5492K. The output was almost identical (4330lx compared to 4380lx). For me, being able to have full control over adjusting green and magenta on a light is a big deal. It allows you to not only create a more accurate lighting source, but it also helps you more closely match fixtures from other manufacturers. Above you can see the light recorded an output of 4150lx (386fc) when set at 3200K and run off mains power. 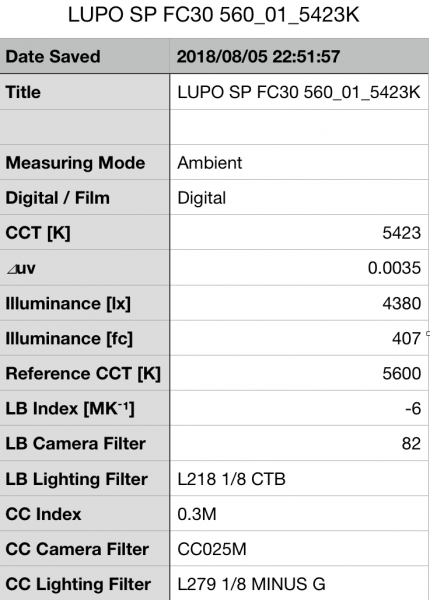 The LUPO produced a Kelvin color temperature of 3065K. The Superpanel had a 0.1M CC Index score. The output was only -5.25% less than when using the light at 5600K. The kelvin color temperature was a little low at 3065. 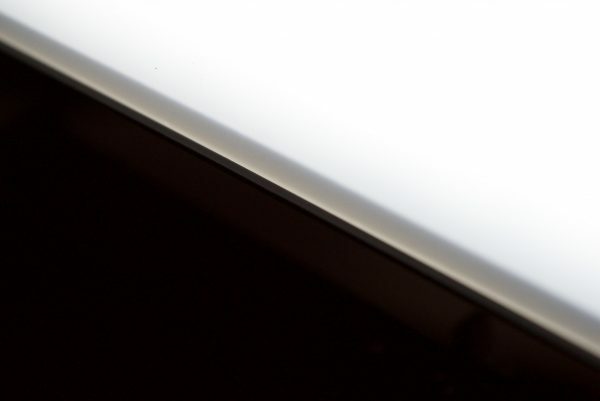 In terms of output compared to the LUPO Superpanel Dual-Color Soft, it was 14.64% brighter. So how does that compare to its direct competition, the Luxli Timpani 1×1 RGBAW LED light? Above you can see the results from the Timpani. The Luxli has 670lx less output (19.25%) than the Lupo. 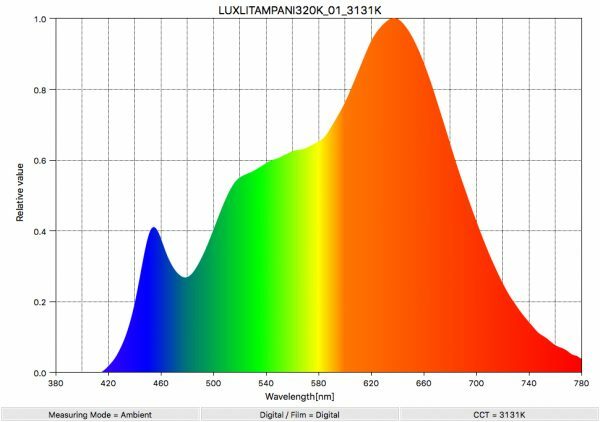 The Kelvin color temperature of the Luxli at 3200K was 3131K, which was slightly better than the 3065K recorded by the Lupo. The Luxli had CC Index score of 0.2M which was slightly worse than the 0.1M of the Lupo. 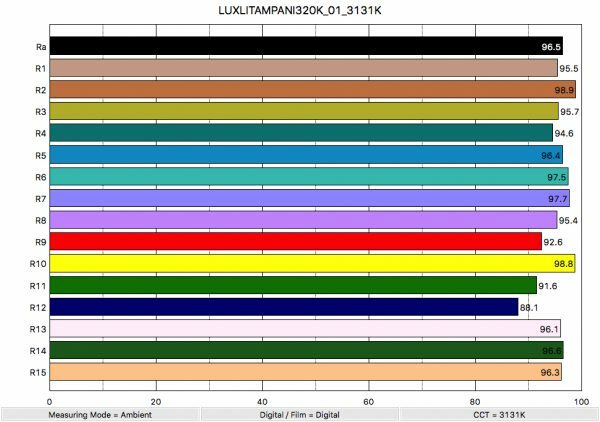 Here is how the 4150lx output and 3065K Kelvin color temperature I measured from the LUPO compares to some other Bi-Colour Soft Panel 1×1 fixtures when used at 3200K. 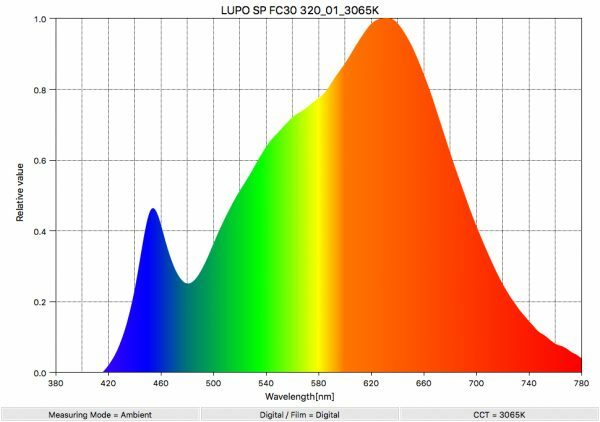 In comparison to its closest competition, the LUPO Full Color 30 has significantly more output when set at 3200K. 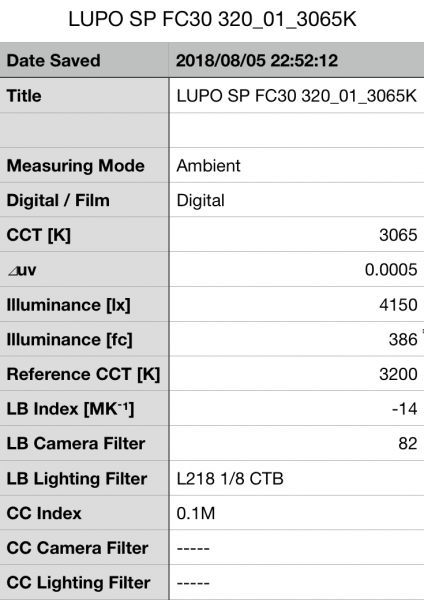 In fact, the LUPO’s output was 88.63% higher than the Litepanels and 105.44% higher than the F&V. As the Lupo Superpanel Dual Color 30 can produce Kelvin color temperatures from 2800K up to 10,000K, I thought I’d also test the light at its extremes. Above you can see the results for the light at both 2800K and 10,000K. These results show me that the light drops output when you start moving the Kelvin temperature dial down from 5600K, or up from 5600K, but only very marginally. The output of the light is extremely impressive. The Kelvin color temperate accuracy of the light could be better, as the figures I recorded were more than 150K off at 3200k, and 5600K. 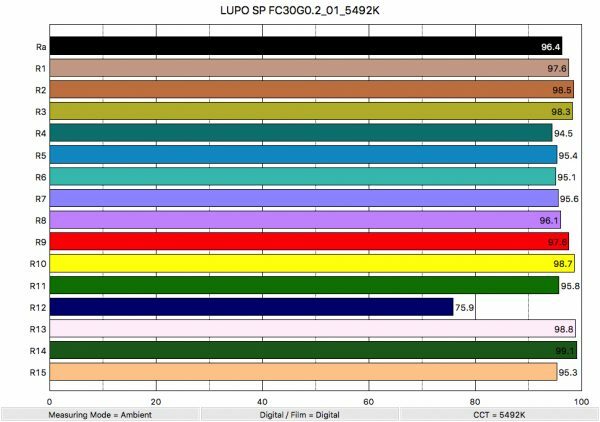 Color rendering scores for the LUPO Superpanel Full Color 30 when set at 5600K. So now that we have seen how much output the LUPO Superpanels Full Color 30 produces, how does it perform when it comes to replicating accurate colors. Above you can see that when the light was set at 5600K it recorded an average CRI (R1-R8) of 95.3 and an extended CRI (R1-R15) of 93.40. For replicating accurate skin tones it recorded 86.2 for R9 (red), 97.3 for R13 (closest to caucasian skin tones), and 94.4 for R15 (closest to Asian skin tones). How does this compare to the Superpanel Dual-Color Soft? The Superpanel Dual-Color Soft recorded an extended CRI (R1-R15) of 93.24. So the new Full Color 30 version actually has slightly better color rendering (well it’s almost the same) which is good to see. It’s nice that LUPO has been able to make an RGBW light without sacrificing the color accuracy. So how does that compare to its direct competition, the Luxli Timpani 1×1 RGBAW LED light? Above you can see the results from the Timpani. The Luxli recorded an average CRI (R1-R8) of 97.8 and an extended CRI (R1-R15) of 96.2. For replicating accurate skin tones it recorded 97.9 for R9 (red), 99.6 for R13 (closest to caucasian skin tones), and 97.0 for R15 (closest to Asian skin tones). These are exceptionally good scores and the best I have ever seen from a 1×1 style light. As I mentioned earlier you have the ability to have full control over adjusting green and magenta. With this in mind, let’s have a look if the color rendering scores improved at 5600K by adding +0.20 green. Above you can see the light recorded an average CRI (R1-R8) of 96.4 and an extended CRI (R1-R15) of 95.48. For replicating accurate skin tones it recorded 97.6 for R9 (red), 98.8 for R13 (closest to caucasian skin tones), and 95.3 for R15 (closest to Asian skin tones). These were quite substantial improvements and it really does show how important having the ability to adjust green and magenta is. Above you can see the scores for when the light was used at 3200K. It recorded an average CRI (R1-R8) of 94.3 and an extended CRI (R1-R15) of 91.86. For replicating accurate skin tones it recorded 76.3 for R9 (red), 95.1 for R13 (closest to caucasian skin tones), and 93.4 for R15 (closest to Asian skin tones). These results were only marginally worse than those of the LUPO Superpanels Dual-Color Soft. So how does that compare to its direct competition, the Luxli Timpani 1×1 RGBAW LED light? Above you can see the results from the Timpani. The Luxli recorded an average CRI (R1-R8) of 96.5 and an extended CRI (R1-R15) of 95.45. For replicating accurate skin tones it recorded 92.6 for R9 (red), 96.1 for R13 (closest to caucasian skin tones), and 96.3 for R15 (closest to Asian skin tones). These are exceptionally good scores and are right up there with some of the best scores I have ever seen from a 1×1 style light. As you can see all the lights have fairly similar Extended CRI scores at 5600K, but the Litepanels and F&V are better at 3200K. Now we have seen the color rendering scores, what’s their spectral distribution like? Well, let’s find out. 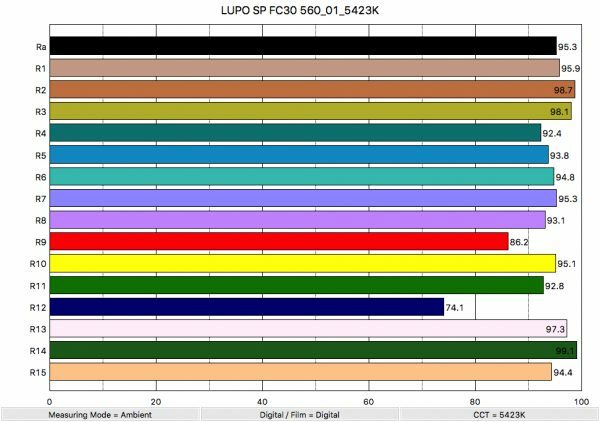 Spectral distribution of the LUPO when it is set at 5600K. Above you can see the spectral distribution of the LUPO when it is set at 5600K. The spectral distribution is fairly good at 5600K and the light only has a marginal green spike. 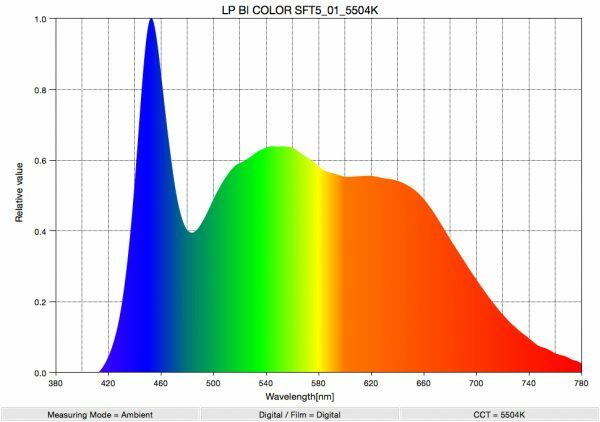 This spectral distribution is fairly common for a lot of LED lights at 5600K. Above you can see the spectral distribution of the Luxli Timpani 1×1 RGBAW when set at 5600K. 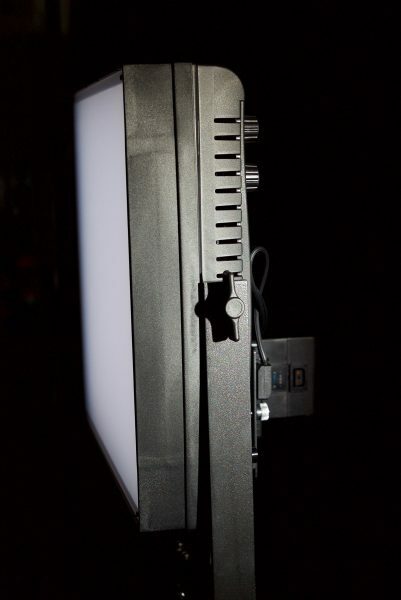 Above you can see the spectral distribution of the Litepanels 1×1 Astra Soft Bi-Color when it is set at 5600K. The spectral distribution of the F&V Z400S Soft when it is set at 5600K. 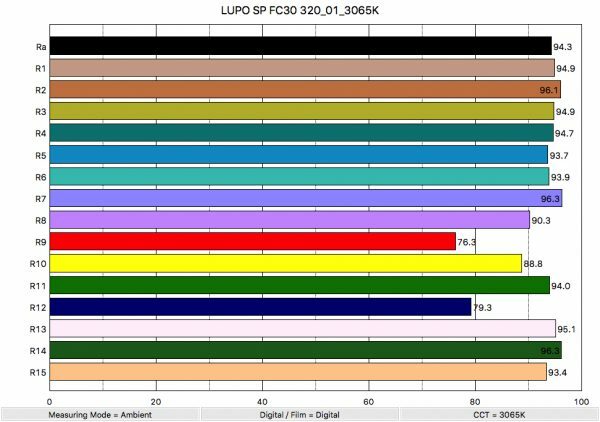 The overall spectral distribution of the Litepanels and the Lupo Superpanel Full Color 30 are very similar, but the LUPO has a slightly fuller color spectrum. The Luxli also has a very similar spectral response to the Lupo. Spectral distribution of the LUPO when it is set at 5600K with +0.20 green added. So now let’s see what the spectral distribution of the LUPO at 5600K looks like if we add +0.20 green. As you can see the slight rise in red that we were seeing before the adjustment was reduced and we increased the spectral response in the 560nm to 610nm range. Spectral distribution of the LUPO when it is set at 3200K. Above you can see the spectral distribution of the LUPO when it is set at 3200K. The spectral distribution is excellent at 3200K and the light doesn’t have any large green spikes. This spectral distribution is very good for a LED light at 3200K. Above you can see the spectral distribution of the Luxli Timpani 1×1 RGBAW when set at 3200K. 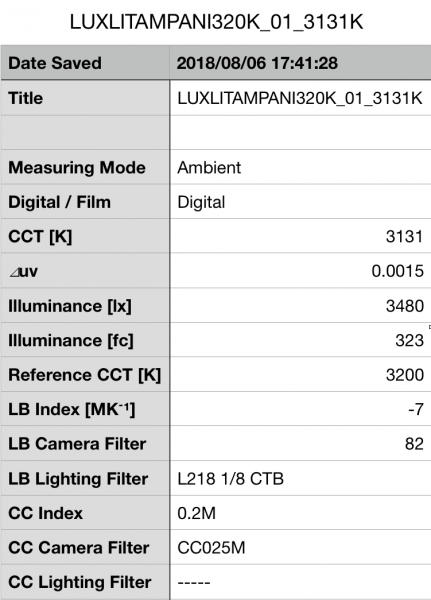 Above you can see the spectral distribution of the Litepanels 1×1 Astra Soft Bi-Color when it is set at 3200K. Above you can see the spectral distribution of the F&V Z400S Soft when it is set at 3200K. 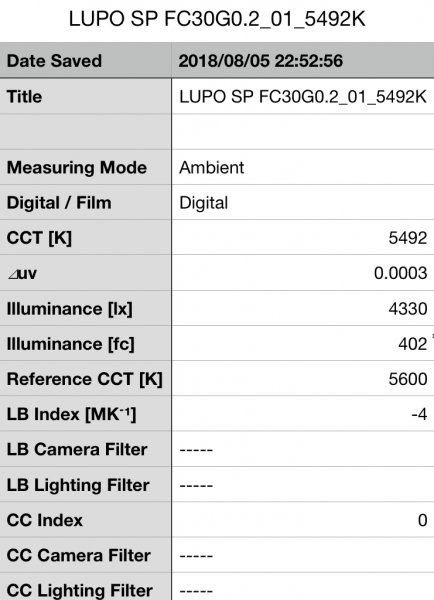 The spectral distribution of all four lights is fairly close, with the LUPO having a slightly more linear and fuller color spectrum than the Litepanels. The Luxli certainly has a bit of a green spike at 3200K. As I always say, photometric scores only tell you part of the story. 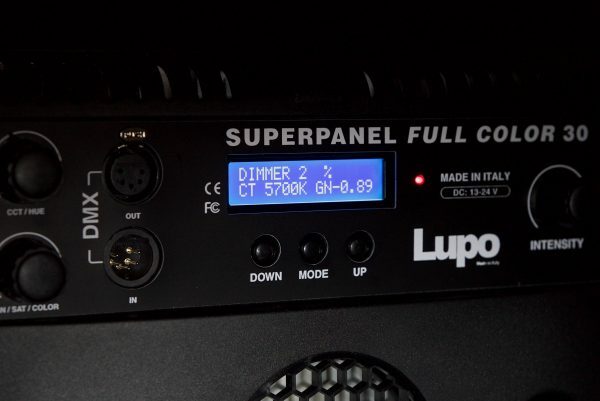 So do the scores from the LUPO Superpanel Full Color 30 translate into real-world performance? Above you can see a few examples using the light as well as how it compares against the Luxli Timpani 1×1 RGBAW. All I have done is set the white balance on the camera to 5600K and I haven’t altered the image in any way in post. I simulated an interview set up and also looked at how wide the beam spread was with both lights and what happens if you used them to indirectly light a room. The interview tests were shot on the Kinefinity MAVO in 6K with a Tokina 85mm T1.5 Cinema Vista lens, the wide shots with a Tokina 18mm T1.5 Cinema Vista. 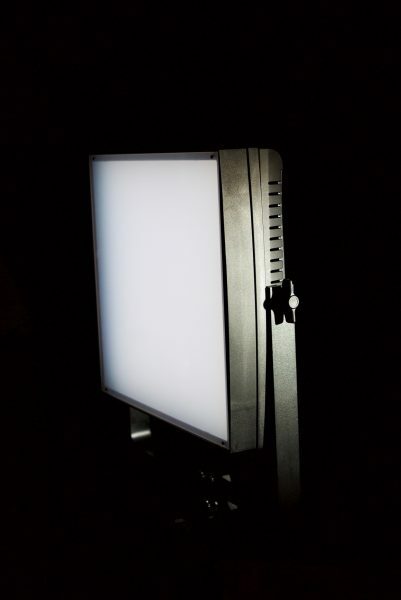 The Lupo Dual Color 30 panel was used as the key light with the Luxi Timpani 1×1 RGBAW light as a backlight. A white poly board was also used on the right-hand side to add some fill. When I tested the Luxli, the Lupo was moved to become the backlight. 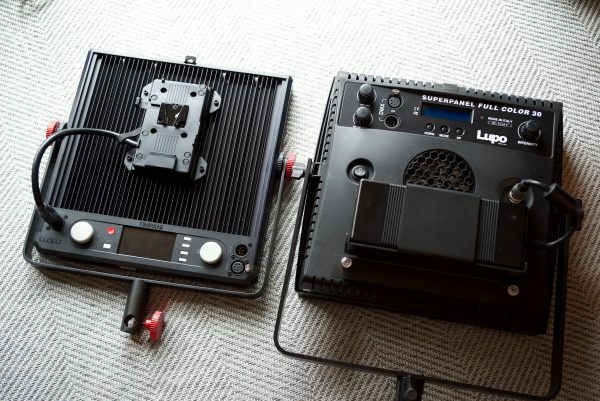 For the interview style shot, the Lupo was using a DoPChoice 40-degree eggcrate and the light was set at 63% intensity. With the Luxli it was using an Angler softbox and an eggcrate. It was set at 100% intensity. The Lupo was noticeably brighter than the Luxli when both lights were set at 5600K for the interview shot. This is hardly surprising as the Lupo has a higher output than the Luxli. To get a softer looking source, the Luxli did require a softbox and that is also going to reduce its output. Both lights are very capable of providing a nice soft source that looks good. The Lupo is more suited for indirectly bouncing light due to its higher output. Starting with a powerful source and heavily diffusing it, in this case through the use of an integrated soft panel, is usually a good way of producing a nice soft source. If you don’t have a high enough output to begin with, and then attempt to heavily diffuse that lighting source, often the brightness of that light is reduced to a point where it’s only usable when placed very close to a subject. This is the main advantage the Lupo Superpanel Full Color 30 has over the Luxli Timpani 1×1 RGBAW, and many other soft panel 1×1 lights. The LUPO’s high output for a soft panel 1×1 light allows you to produce a really nice soft lighting source that still packs a punch. This makes the light ideal for solo operators who need a light that is quick to set up. As the light source is already diffused you can get away without needing to use a softbox. The lights 115-degree beam angle does mean you need to use an egg crate or barn doors to control the spill during interviews. The light is also bright and soft enough that it can be used for lighting up some rooms by indirectly bouncing it into a wall or ceiling if you just need some additional fill and don’t want the light to look forced. It’s also an ideal light for news crews doing live crosses as the fixture can be run off a camera battery and it’s powerful enough to provide a nice amount of soft light unless you are in really bright conditions. You do need to be aware, however, that the light draws 200W so you need to have a high capacity battery to use this light remotely in the field. Having the ability to control green and magenta is huge, and this is perhaps the feature I like the most about this light. Being able to match other fixtures as well as getting rid of any green or magenta that you may see when using the light is something you shouldn’t take for granted. As far as the RGBW, HSI, and effects modes go, while they are great to have available I don’t tend to use those features that much in my line of work. In saying that, being able to generate different colors is handy for lighting up backdrops or creating color separation during interviews. It’s also nice to be able to use the light to help illuminate green screens very easily. 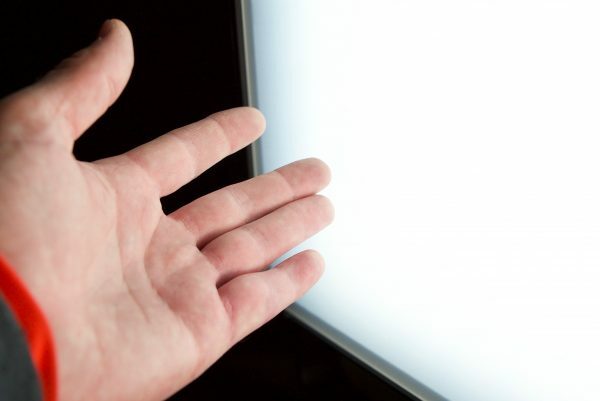 Do you actually need an RGBW light? Just because we want something, doesn’t necessarily mean that we need it. 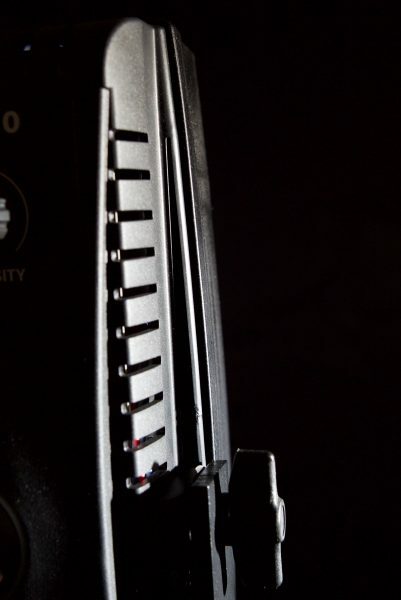 Whether you actually need an RGBW light really depends on the type of things that you shoot. 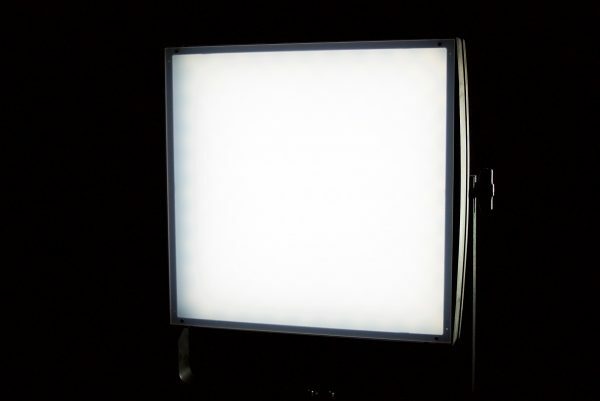 If you are primarily shooting interviews then having an RGBW light may not make a lot of sense. However, in saying that, the price point of the Full Color 30 is not that much more than buying a regular Superpanel. In that regard, it probably is worth the extra money to get all of the additional features even if you have no need for them now. If the type of work you do changes then at least you have a light that has the functionality to be used for other applications. Even if you have no need for creating colors or using effects with your lighting, RGBW lights do give you access to creating a far wider range of Kelvin color temperatures than their regular LED counterparts. Having the ability to dial in a Kelvin color temperature between 2,800 – 10,000 K can be extremely handy. The Superpanel Full Color 30 from Lupo is a great alternative to much larger, heavier and more expensive RGBW lights. 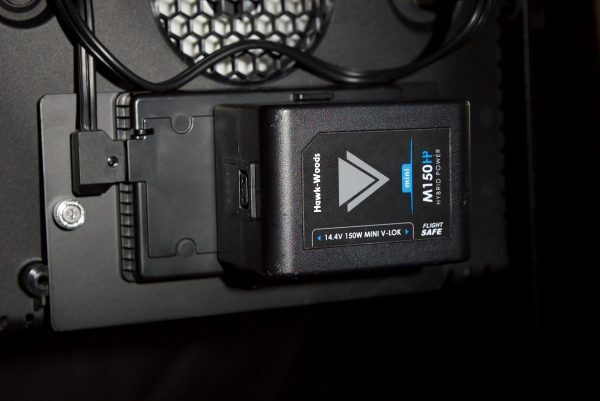 If you travel a lot or need a very portable RGBW solution that is quick and easy to use for lighting interviews, live crosses, music videos or just about any other application where you require an RGBW, battery-powered light (as long as you have access to a large enough battery), it’s a great option. With an impressive output considering its size, a nice range of features, and accurate color rendition, it’s really hard to overlook if you are looking to buy a new portable 1×1 style RGBW LED light. Again as I have mentioned numerous times, you do need to be aware of the higher power draw of this light and use an appropriate high capacity battery to remotely power it. For people who travel a lot, this may be a deal breaker. The direct competition comes from the Luxli Timpani 1×1 RGBAW LED Light which is lighter, has a Bluetooth app and is considerably cheaper than the Lupo Full Color 30. It is also slightly more color accurate and has a lower power draw, but it doesn’t have the output of the Lupo. Lupo has done an outstanding job with the Superpanels, and this latest RGBW version is a great solution for anyone who wants to dip their toes into the world of RGBW lights.